An iconic mural of Chinese philosopher Lao Tsu in Vancouver’s Chinatown neighbourhood will be blocked by a new six-storey building. 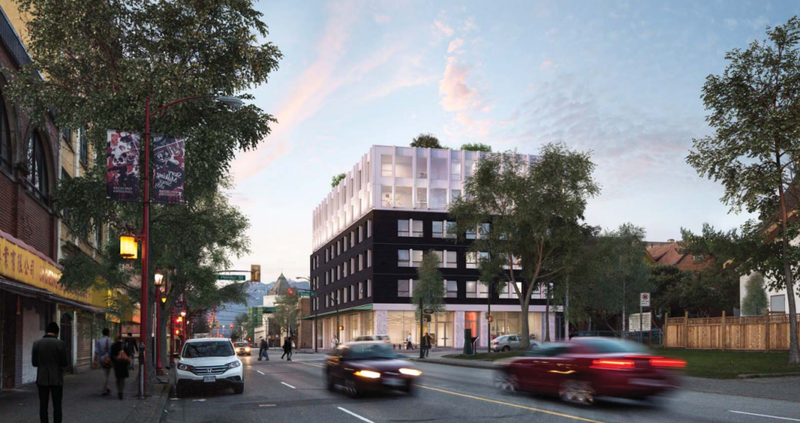 Yesterday, Vancouver City Council voted to approve the rezoning required for 450 Gore Avenue, a 61-unit for-profit affordable rental housing project at the northeast corner of East Pender Street and Gore Avenue. This includes 10 micro-dwelling units and a guarantee that 25 per cent of the total number of units will be suitable for families with young children. It provides additional much-needed rental stock to the local housing market, especially within the city core, while also providing Chinatown with another revitalization opportunity after more than two decades of decline. However, the project on the vacant lot will block a 223-square-metre mural of Lao Tsu painted on the wall of the adjacent building. The mural by local artist Alex Li is a relatively recent addition to the neighbourhood painted in late-2010 to commemorate the 125th anniversary of Chinatown. Critics of the development project also assert Chinatown’s historic character is not being protected and that the neighbourhood is being gentrified, but proponents say change is necessary to rejuvenate struggling local businesses and reinforce the neighbourhood’s place as a cultural destination. An increase in the number of residents living in Chinatown is necessary to restore the once-active streets and shops. The project follows the approved framework outlined in the City’s Downtown Eastside Improvement Plan. UPDATE: Vancouver City Council has added a condition to the development: it must create a new mural to reflect the character and history of Chinatown.